Who thought that one day moon would come visiting us on Earth and we would be in love with it like never before? I have always been fascinated by this astronomical body that revolves around Mother Earth. Unlike our planets or satellites that are far, far away and cannot be seen without the telescope, moon has always been easy to spot with our naked eyes. In fact, each one of us has grown up seeing the moon as it is the closest celestial body that exists around Earth. This natural satellite is not only about starry nights but it has always been an inspiration for artists, poets, singers and more. In India, Moon enjoys a special stature as its different shapes and phases play an important role in our Hindi calendar. Personally, ever since I had read about Neil Alden Armstrong, I have always felt a strong connection with the moon. Last but not the least, how can a married lady forget to talk about ‘Karvachauth’, the famous fasting festival in India. On this day, married women keep a fast for the whole day and break it only after the moon graces the occasion. How did the Moon come visiting us? Interesting, the moon has come on a visit on Earth. 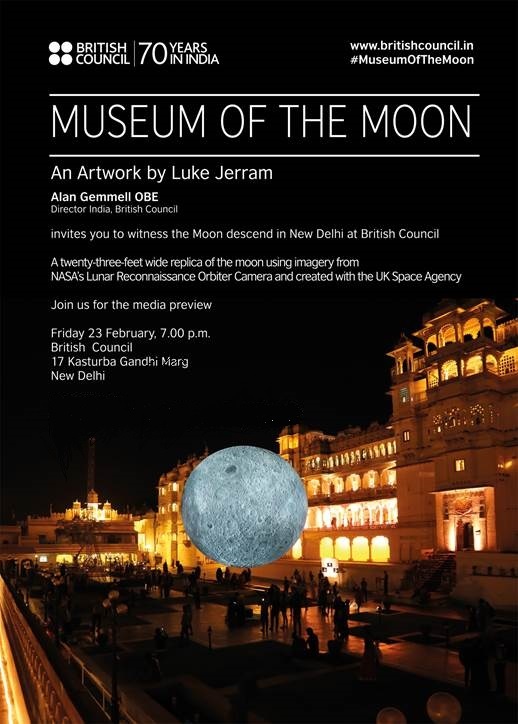 The Moon has come to India through Luke Jerram’s art work. 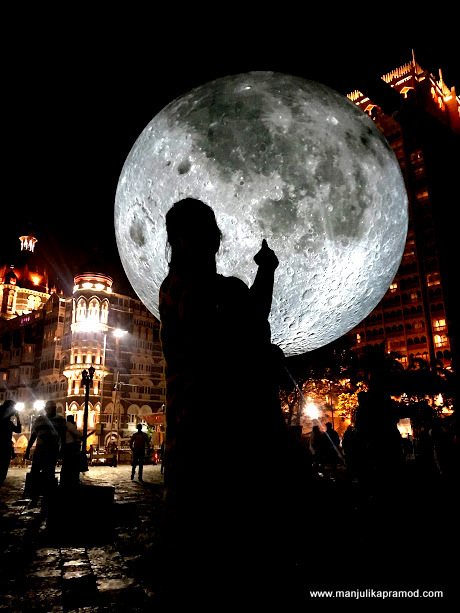 This 23-feet wide, replica of the moon called ‘Museum of the Moon’ is nothing less than a dream. It is a beautiful piece of work that leaves the onlookers awestruck. I know it because I was lucky to see it in Mumbai a few weeks ago when it was stationed near Gateway of India. 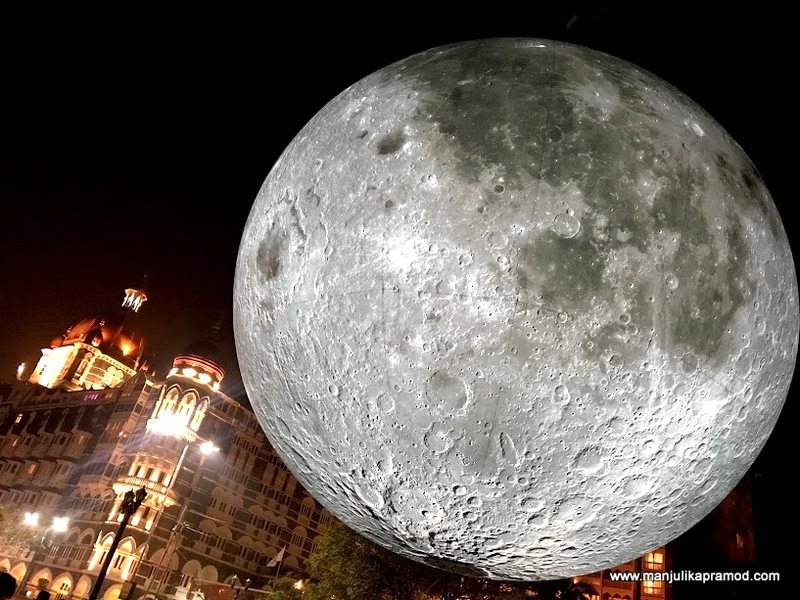 This artistic model of the moon has been to some of India’s most iconic spots. It has travelled from National Gallery of Modern Art Bengaluru to the Gateway of India Mumbai to the City Palace Udaipur to the Victorial Memorial Hall, Kolkata. And finally it is at the iconic British Council headquarters in New Delhi till 01 March 2018! This artwork is also one of the ways through which British Council is celebrating 70 years in India. Delhiites, this is your chance. Trust me, it is a visual spectacle. I was waiting for the Moon to come to Delhi but due to some reason I had to miss the media preview. However, I had got in Mumbai. This was almost like travelling to the Moon and back. I am sure it sounds exaggerated but it was truly spectacular. 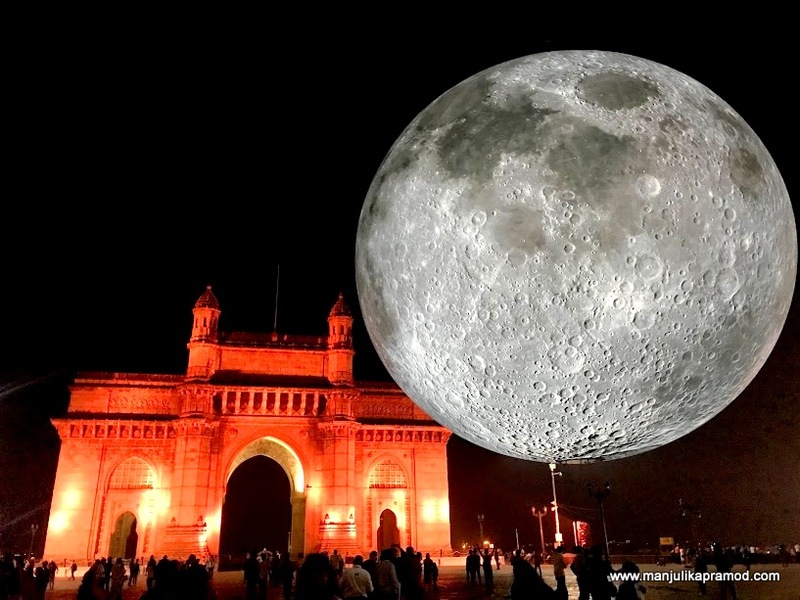 A huge balloon, a complete replica of the moon was very strategically placed at the gateway of India. It enhanced the beauty of the surroundings by a hundred times. A lot of work has been done to make it as real as possible. One centimeter of it represents 5 kilometers of lunar surface. To give you an idea, here are the pictures from my Mumbai visit. This moon carries the imagery from NASA’s Lunar Reconnaissance Orbiter Camera and is created by the UK Space Agency. The moon is going to be here till 1st March. Go and enjoy it at the iconic British Council headquarters. The moon does look amazing. What a brilliant piece of art!! Oh wow, this sounds like a good exhibition! I’m based in the UK, so I’m a little jealous that I can’t see the moon too! Enjoy the rest of the museum, I’ll look out for any similar events that may be happening here. Wow! It funny, but I saw a moon just like this in Belfast last Halloween! I do not know if it was the same exhibition, but I do relate to the amazing feeling I had seein the huge sphere glowing in the middle of a room. Definitely an excellent show for any astronomy lover! I had read another post about this by a blogger who visited it in Bangalore. I must admit though that it does look great silhouetted against Mumbai’s landmarks like the Gateway of India and the Tajmahal Hotel. OMG! This is so cool. I love this artwork as the moon looks really beautiful and carefully made. It’s sad that I cannot visit the place right now to enjoy this exhibition, but I can imagine how now it is to observe it in a real life. Wow what a fabulous piece of art! This would be so impressive to see up close in person. I’m also a bit obsessed with our astro world. I absolutely love visiting planetariums to see different shows about our night sky. I love trying to photograph the milky way! Manjulika Pramod, thank you for your blog post.Really thank you! Awesome. Wow looks great! We were in Mumbai not too long ago shame we didn’t catch it! Would love to see that if we went back. Does this happen every year or just a one off? It looks really pretty from your photos. Wow, Just one word for it ‘Spectacular’!!!!! I had never experienced such thing in my life. Yesterday I saw it in Delhi.I wish I can attach beautiful photos here for fellow members here. Thanks, Manjulika Pramod for your blog post. For letting us know about the event. I hope it comes to Bangalore next. It was amazing reading about your experience of it. I can see why it is so appealing visually. The artist has done a fantastic job of it. Love that shot of your silhouette against it. A very nice creative one.